All TPW™ products are designed using the very latest sports nutrition research and technology. Our best-selling WHEY PROTEIN 80 and DIET WHEY ISOLATE 97 are no different. Both are now formulated with the breakthrough patented enzyme system, AMINOGEN®. This revolutionary system helps your body to absorb even more free amino acids locked within your whey protein. This in turn can help build lean muscle, increase lean body mass, decrease body fat and support vital body functions. 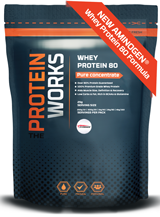 In essence, AMINOGEN® is formulated to make your WHEY PROTEIN 80 and DIET WHEY ISOLATE 97 even more effective, and at no extra cost! It is the same incredible price, but now including the very latest sports nutrition technology. Aminogen® is a revolutionary technology designed to improve protein digestion and increase amino acid levels absorbed from dietary protein. Clinical research has shown Aminogen® to increase BCAA retention levels by 250%, nitrogen levels in muscle by 32% and overall amino acid plasma levels by 100%. Researchers also found all amino acids, essential & conditionally essential, including branched chain amino acids, are released in greater amounts when protein is digested with Aminogen®. What's more, Aminogen® is 100% natural and ideal for anyone looking to build quality muscle or achieve lean body definition. Diet Whey Isolate 97 is the purest whey protein isolate, renowned for having the highest protein content and lowest carbohydrate and fat content of any protein in sports nutrition today. It is designed specifically for anyone wanting to lower their body fat or lose weight - with less than 1g of fat and less than 1g of carbohydrates per serving. Now infused with Aminogen® to help you unlock the free amino acids locked inside your Diet Whey Isolate 97, including Leucine - an amino acid thought to enhance the body's ability to burn fat. The ultimate value of any protein supplement is in its amino acid composition. Amino acids are the building blocks of protein. For a protein to be usable in the body, it must first be broken down into shorter amino acid chains. So when you take a whey protein supplement, the body gets to work breaking down the long protein chains into shorter digestible chains for use in physiological processes such as growth and repair. 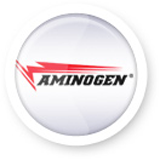 Enter Aminogen®. Aminogen® gets to work right away, releasing the essential amino acids from the protein chain. Breaking free the amino acids from the protein molecule in this way creates a pool of ready-made small molecules, easily absorbed by the body. Studies have shown that Aminogen® technology has the ability to release more amino acids from protein than is possible by the body's digestive enzymes alone. Aminogen® improves protein absorption, muscle nitrogen retention and, more importantly, helps you get the most out of your whey protein.